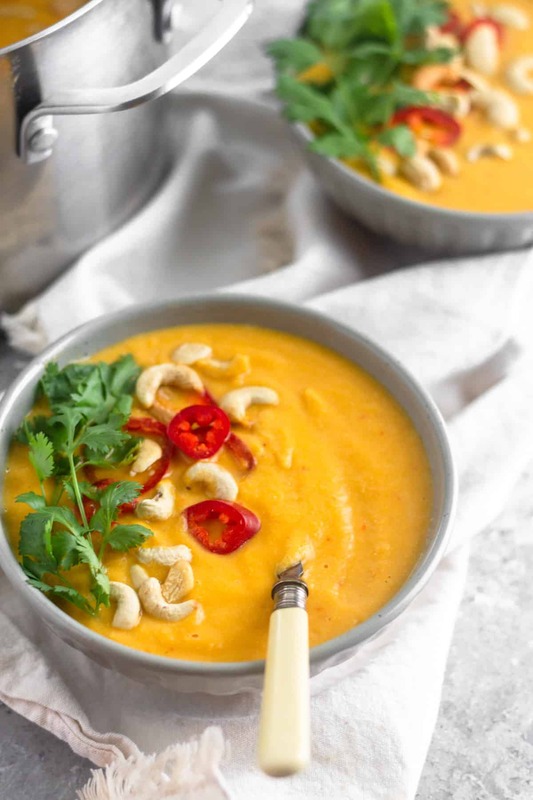 Set it and forget it, this healthy Crockpot Pumpkin Soup is only 6 ingredients and makes dinner a breeze. It’s paleo, vegan, gluten free, and Whole30 complaint! 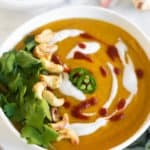 Are you sick of the pumpkin recipes yet? 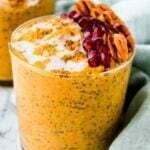 I hope not because already showed those protein pumpkin chocolate chip energy balls and I have another for pumpkin recipe for this week and another for next week! And then I’m sure you will see a few more sprinkled in there as well. I mean tis the season right? 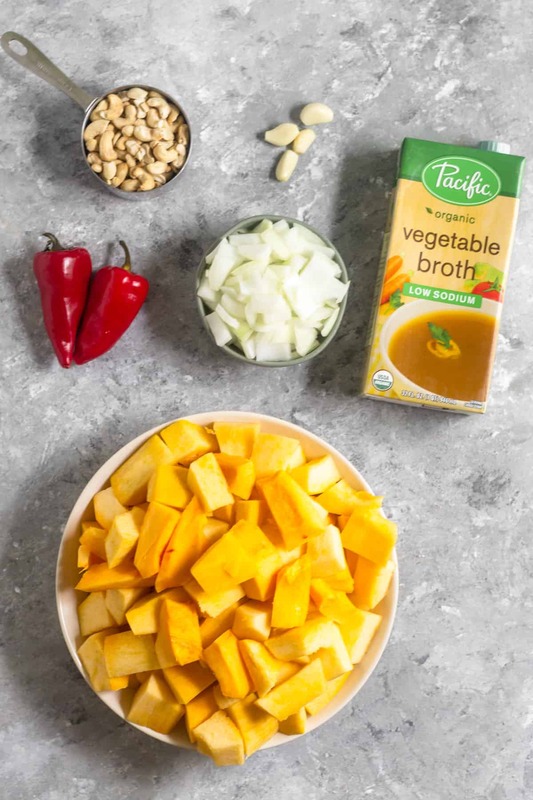 We are taking it into full fall mode with this one – an easy crockpot pumpkin soup! It couldn’t be better timing cause it has actually been feeling like fall here in Austin. Which is strange because usually it’s in the mid 80s around this time of year. The weather has actually been cold and rainy, like nonstop rain, which hasn’t been that enjoyable. I can dig the cooler temperatures, but when the rain comes along with it, it’s not that fun. But I love soup and fall is definitely soup season! And this one legit couldn’t be easier to make! 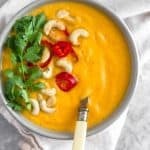 Spicy Crockpot Pumpkin Soup with Real Pumpkin! 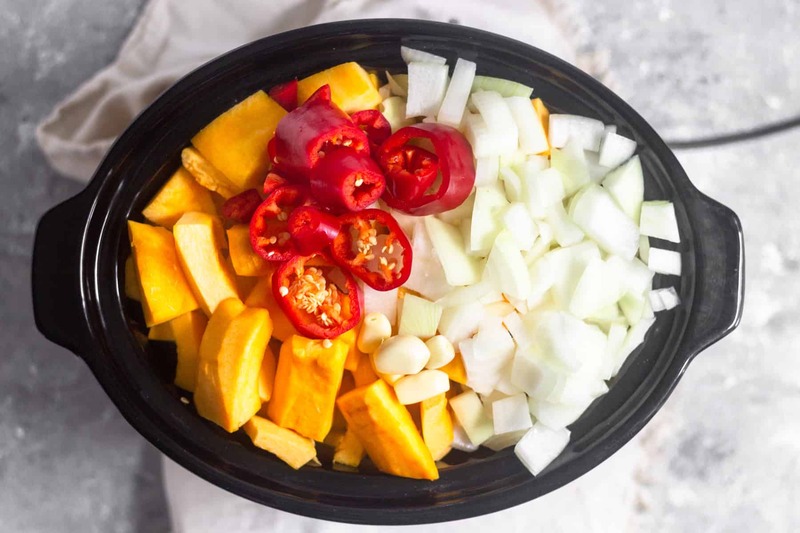 To make crockpot pumpkin soup, all you need to do is dump your ingredients into your slow cooker and set it! 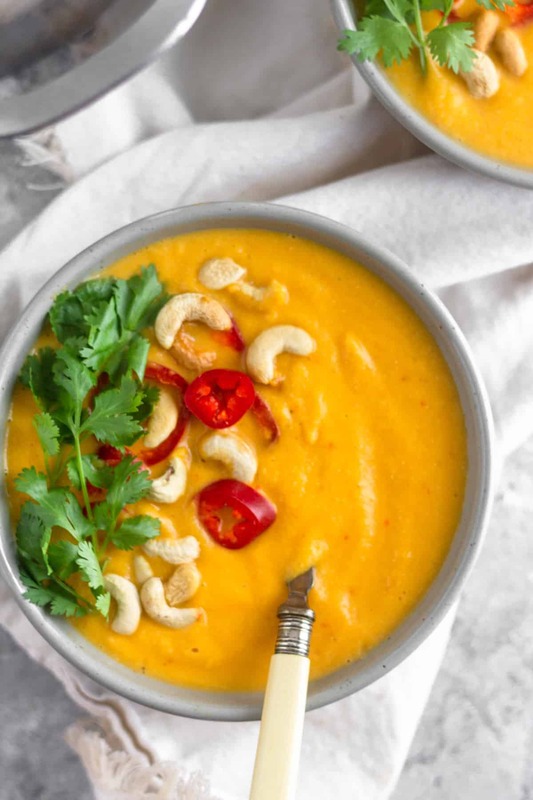 The only thing you don’t add is the cashews, and you blend those in at the end (it makes a great creamy consistency). Since a lot of pumpkin recipes are more sweet, I went the savory route and added jalapeños to kick it up some. 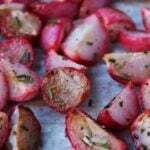 You can either leave the seeds or remove them depending on how much spice you want (the less seeds, the less spicy). While I haven’t tested this recipe with canned pumpkin, I think it would work. If you try it, would reduce the amount of cups to 6-8 cups of canned pumpkin. 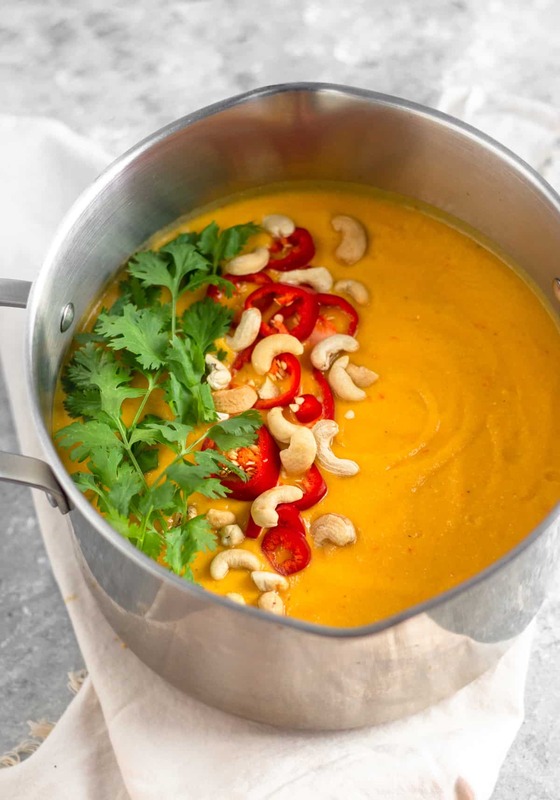 You might want to add some more cashews as well to thicken it up at the end. 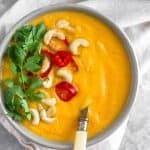 With life being pretty busy lately, this crockpot pumpkin soup is a life saver. We had it on hand for a week for quick and easy meals. 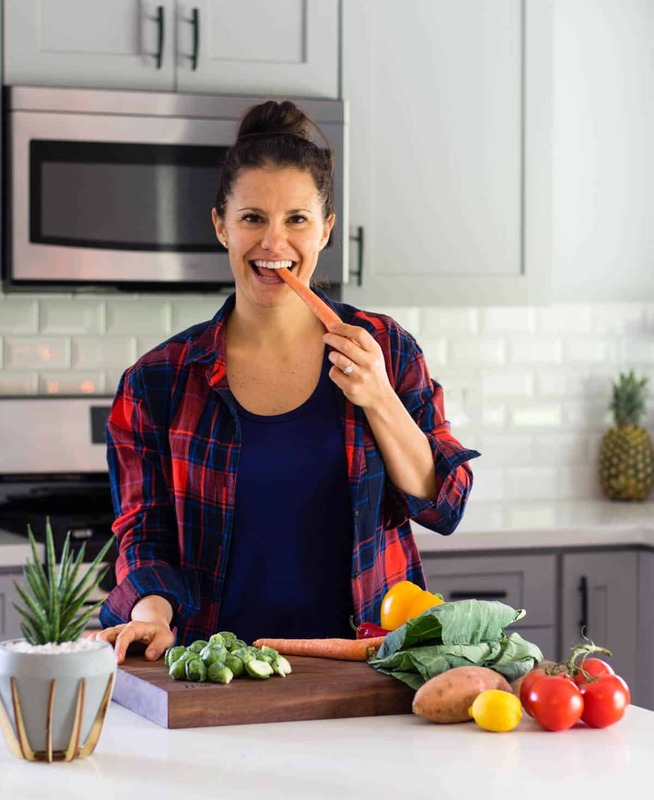 It makes a great meal prep recipe and should keep in the fridge for a week or so in a tightly sealed glass container. 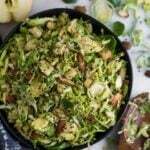 You can add some protein to make it a complete meal or even some collagen. Since it does make a lot, feel free to cut the recipe in half! 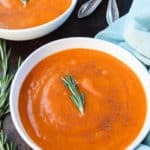 Set it and forget it, this healthy Crockpot Pumpkin Soup is only 6 ingredients and makes dinner a breeze. It's paleo, vegan, gluten free, and Whole30 complaint! 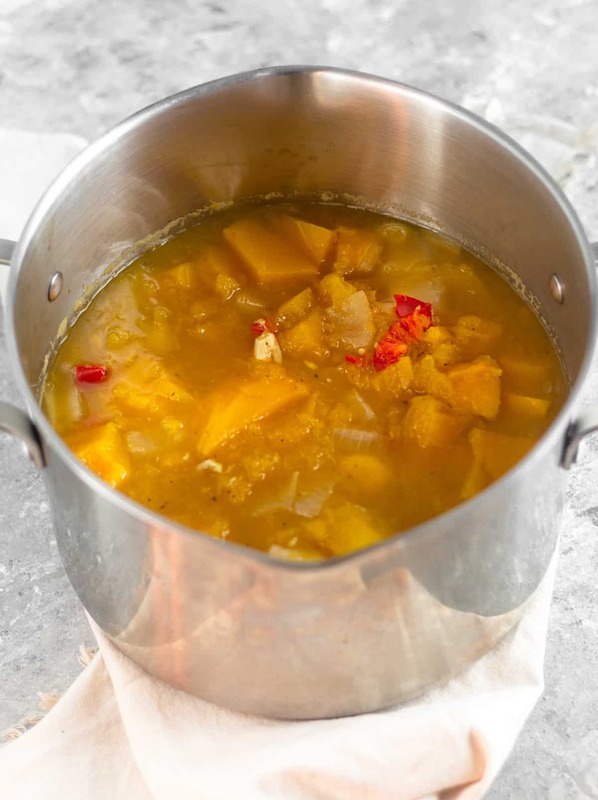 Place pumpkin, onion, garlic, jalapeno, and vegetable broth in a crockpot. Place on low for 8 hours. Place cashews in a bowl and cover with water. Let sit while the soup cooks. 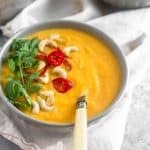 Once soup is done, drain cashews. 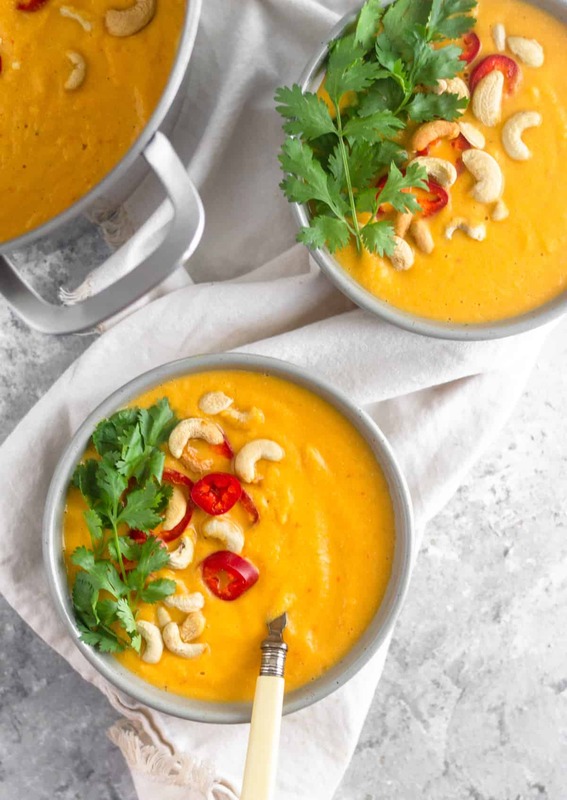 Transfer ingredients, along with the cashews, to a Vitamix, high powered blender, or food processor and blend until smooth. You might have to do this in a few batches. Garnish or eat as is. Enjoy! *deseed jalapeños for less spice. I’m wondering if butternut squash can be substituted for pumpkin….. Yes, I don’t see why not. Sounds like a delicious substitute! Sounds delicious! 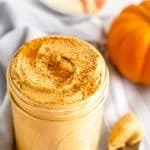 How much pureed canned pumpkin would you use to replace the fresh pumpkin? Hey Lynn! I haven’t tried it, but I think you could do 6-8 cups of canned pumpkin and then cut the liquid by half at least. It is a pretty thick and creamy soup, so if you add too much liquid, I’m afraid it would be a little runny. Hope that helps! Yes! That would work just fine Cindi!